Here's healthy eating activities for kids and healthy recipes for kids activities. Whether in the classroom, a party or getting your own kids eating healthy, here's kids snack ideas for using veggies and making healthy food choices. Want new ways to get kids eating real food? Want them to help you make healthy meals for kids tastes? Growing "egghead hair" is fun! You need eggs and wheat kernels. You can get wheat "berries" i.e. kernels of wheat from a Health Food Store, often in bulk, so you can just buy a hand full. Carefully crack one raw egg for each child, and save the lower two thirds of the shell. Wash and draw a face on the egg shell. Put a small piece of moistened paper towel in the bottom of the egg and add a tsp. to a tbsp. of wheat kernels. Put egg shells in egg carton and cover with lid until sprouts appear. Keep moist but not soggy. When sprouts appear, put them in the light. Within a few days the sprouts will become "egghead hair" and can be clipped with scissors to taste. You can encourage kids to taste (chew on) the wheat grass, and if you live near a juice bar, show them the trays of wheat grass and the juice made from it, and the green juice. 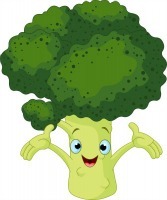 Make a "fairy prince or princess broccoli forest" for a birthday party for small kids. Slightly steamed broccoli florets mounted all over it. We got the kids involved, and they loved it! 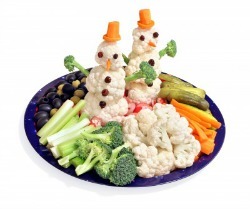 add these cauliflower snowmen with a dip to your healthy recipes for kids activities. 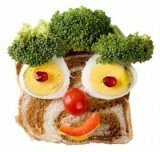 Why not healthy eating activities for kids parties? Yum, fun healthy snacks for kids to play with. Kids can "Red & Green Light" their Choices! Want to motivate kids to choose healthier foods? A successful weight loss program at Stanford, California, has taught many kids to signal their foods with a "green light", "yellow light" or put the brakes on by giving food a "red light." This program at Lucile Packard Children's hospital taught kids to give a "green light" to vegetables and water, but give a STOP, or a "red light" to cheese burgers, fries, deep fried chicken nuggets, treats like frozen yogurt and drinking soda. The "yellow light" foods could be eaten often, but they were not to go overboard with them, such as fruits, meat, grains, beans, and fish. Kids between the ages of 8 and 15 who did this program, had an 80 percent long-term success rate for weight loss. Usually, most weight loss programs for kids have less than a 50 percent success rate. The key, say program organizers, is involving kids and motivating THEM to make changes. Here's a book for young children that teaches green / orange / red light foods. Gives great reasons for eating healthy - even 'grown-ups' may be surprised at this clear the message. A good intro for healthy eating activities for kids, and good for arming kids with appealing reasons to begin to make good choices in their carb and sugar overloaded world. • Helps kids see why their fresh veggy, nut, yogurt, fruit lunches and snacks have them grow healthy and feel good far more than the donuts their best friend brings to school! Quiz: Which Vegetable Do Kids Like BEST? 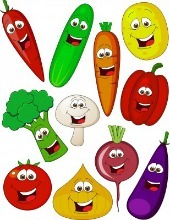 What's at the TOP OF THE LIST for kids when they are asked to choose their favorite vegetables? QUIZ: What are the top FIVE veggies that parents buy? Spinach ranked LAST on the parents' list. Spinach is one of the top SUPER FOODS, and can be put in a salad with strawberries that kids like. Maybe parents ought to tune in to make healthy meals for kids!! 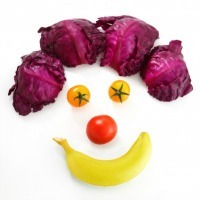 Kids can Vote at "Produce for Kids"
Your Healthy Recipes for Kids? 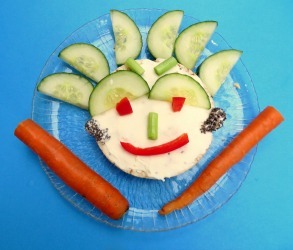 We hope that you'll try our kids snack ideas to get your kids eating healthy and having fun. Healthy recipes for kids can involve them and be as much fun in the class room or at home.